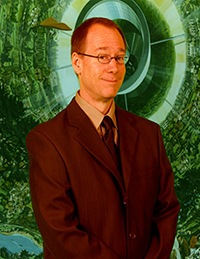 Joel Hodgson is best known for creating the Peabody award-winning movie riffing sci-fi series Mystery Science Theater 3000. He was also the host of the series for the first 100 episodes. Recently, MST3K has been included in several “top 100 TV shows of all time” lists, including Entertainment Weekly, Time Magazine, and Rolling Stone. Joel Hodgson started out in show business as a stand-up comedian and appeared on HBO’s Young Comedians Special as well as The Late Show with David Letterman on CBS and NBC’s Saturday Night Live. Joel also had several appearances on the beloved Freaks and Geeks TV series on NBC and currently does the voice of Mayor Dewey on Cartoon Network’s Steven Universe. In November of 2015, Joel created the BringBackMST3K.com campaign through Kickstarter and along with the show's “backers” raised over 6 million dollars to fund new episodes of MST3K while setting a world record for the most funded film or video project ever! The 14 new episodes feature an all-new cast as well as cameos by the original MST3K cast and writers. MST3K: The Return was launched on Netflix in April 2017. It was critically acclaimed, including “100% Fresh” on Rotten Tomatoes, which currently makes it the highest-rated show on Netflix!